Material Cultures: £650. 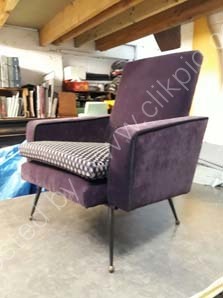 1950’s French Atomic Style Armchair- click on image for more information. £650 1950’s French Atomic Style Armchair, covered in Impala velvet and Designers Guild geometric pattern fabric.